1 Rank based on 2005 figures. 2 On par with US dollar. Bermuda (also known as The Bermuda Islands and formerly as The Somers Isles) is an overseas territory of the United Kingdom in the North Atlantic Ocean, situated around 640 miles (1030 km) northeast of Florida and is actually about 667 miles (1073 km) east-southeast of Cape Hatteras, North Carolina (see Geography section below)—off the east coast of the United States. It is the oldest remaining British overseas territory, settled by England a century before the Acts of Union and two centuries before the creation of the United Kingdom. Although commonly referred to in the singular, the territory consists of approximately 138 islands, with a total area of 27.7 sq. mi. (71.7 square kilometers). Compiling a list of these islands is often complicated, as many have more than one name (as does the entire archipelago, which, in addition to its two official names, has historically been known as "La Garza", "Virgineola", and the "Isle of Devils"). Despite the limited land mass, there has also been a tendency for place names to be repeated; there are, for instance, two islands named "Long Island", two bays known as "Long Bay" and the town of St. George is located within the parish of St. George on the island of St. George. Meanwhile, Bermuda's capital, the City of Hamilton, lies in Pembroke Parish, not Hamilton Parish, on the largest island, "Main Island", which itself is sometimes called "Bermuda" (or "Great Bermuda"). Bermuda has a thriving economy, with a large financial sector and tourism industry. It is blessed with a warm, tropical climate and beautiful beaches. Bermuda is one of the few islands in the world to boast pink sand and turquoise oceans. Wikimedia Atlas of Bermuda . "The Generall Historie of Virginia, New-England, and the Summer Isles", by Capt. John Smith. Bermuda was discovered by the early 1500s, probably in 1503, according to some sources. It was certainly known by 1511, when Peter Martyr d'Anghiera published his Legatio Babylonica, which mentioned Bermuda, and the island was also included on Spanish charts of this year. The discovery is attributed to a Spanish explorer, Juan de Bermudez. Both Spanish and Portuguese ships used the islands as a replenishment spot for fresh meat and water, but legends of spirits and devils, now thought to have stemmed only from the callings of raucous birds (most likely the Bermuda Petrel), and of perpetual, storm-wracked conditions (most early visitors arrived under such conditions), kept them from attempting any permanent settlement on the Isle of Devils. Bermudez and Gonzales Ferdinando d'Oviedo ventured to Bermuda in 1514 or 1515 with the intention to drop off a breeding stock of hogs on the island as a future stock of fresh meat for passing ships. The inclement weather prevented them landing however. Some years later, a Portuguese ship on the way home from San Domingo wedged itself between two rocks on the reef. The crew tried to salvage as much as they could and spent the next four months building a new hull from Bermuda cedar to return to their initial departure point. One of these stranded sailors is most likely the person who carved the initials "R" and "P", "1543" into Spanish Rock. The initials probably stood for "Rex Portugaline" and later were incorrectly attributed to the Spanish, leading to the misnaming of this rocky outcrop of Bermuda. For the next century the island was probably visited frequently but not settled. 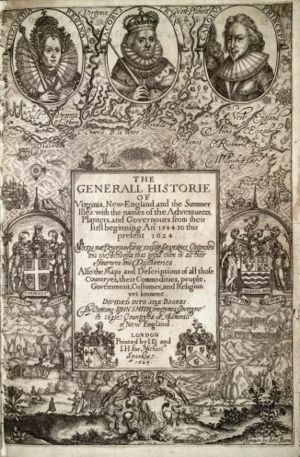 The first two British colonies in Virginia had failed, and a more determined effort was initiated by King James I of England and VI of Scotland, who granted a Royal Charter to The Virginia Company. In 1609, a flotilla of ships left England under the Company's Admiral, Sir George Somers, to relieve the colony of Jamestown, settled two years before. Somers had previous experience sailing with both Sir Francis Drake and Sir Walter Raleigh. The flotilla was broken up by a storm, and the flagship, the Sea Venture, was wrecked off Bermuda (as depicted on the territory's Coat of Arms), leaving the survivors in possession of a new territory. (William Shakespeare's play The Tempest may have been influenced by William Strachey's account of this shipwreck.) The island was claimed for the English Crown, and the charter of the Virginia Company was extended to include it. In 1615, the island was passed to a new company, the Somers Isles Company (The Somers Isles remains an official name for the Colony), formed by the same shareholders. The first British coins in America were struck here. Most of the survivors of the Sea Venture had carried on to Jamestown in 1610 aboard two Bermuda-built ships. Among these was John Rolfe, who left a wife and child buried in Bermuda, but in Jamestown would marry Pocahontas, a daughter of Powhatan. Rolfe was also single-handedly responsible for beginning Virginia's tobacco industry (the economic basis of the Colony had been intended to be lumber). Deliberate settlement of Bermuda began with the arrival of the Plough, in 1612. With its limited land area, Bermuda has had difficulty ever since with population growth. In the first two centuries of settlement, it relied on steady emigration to keep the population manageable. Before the American Revolution, more than ten thousand Bermudans emigrated, primarily to the American South, where England (later, Britain) was displacing Spain as the dominant European imperial power. A steady trickle of outward migration continued as, by the end of the eighteenth century, with seafaring being the only real industry, at least a third of the island's manpower was at sea at any one time. In the seventeenth century, however, the Somers Isles Company suppressed shipbuilding as it needed Bermudians to farm if it was to generate any income from the land. Bermuda was not a great success as an agricultural colony. The Bermuda cedar boxes it shipped tobacco to England in were reportedly worth more than their contents. The colony of Virginia far surpassed Bermuda in both quality and quantity of tobacco produced. After the dissolution of the Somers Isle Company, Bermudians rapidly abandoned agriculture for ship-building, replanting farmland with the native juniper ( Juniperus bermudiana, also called Bermuda cedar) trees that grew thickly over the whole island. Establishing effective control over the Turks Islands, Bermudians deforested their landscape to begin the salt trade that would become the world's largest, and remained the cornerstone of Bermuda's economy for the next century. After the American Revolution, the British Royal Navy began improving the harbours and built a large dockyard on Ireland Island, in the west of the chain. Thereafter the navy used the bases as a strategic asset which later benefited the USA as well (see below). Bermuda was a point where Confederate States blockade runners could touch before heading to the South, and a small museum in Hamilton preserves the office of the CSA agent who coordinated their activities. In the early twentieth century, as modern transport and communication systems developed, Bermuda became a popular destination for wealthy US, Canadian and British tourists. In addition, the Smoot-Hawley Tariff Act enacted by the United States against its trading partners in 1930 cut off Bermuda's once-thriving agricultural export trade – primarily fresh vegetables to the US – spurring the overseas territory to develop its tourist industry, which is second behind international business in terms of economic importance to the island. Executive authority in Bermuda is invested in The Queen and is exercised on her behalf by the Governor. The Governor is appointed by the Queen on the advice of the British Government. Defence and Foreign Affairs remain the responsibility of the United Kingdom, which also retains responsibility to ensure good government. It must approve any changes to the Constitution of Bermuda. The Constitution of Bermuda came into force on June 1, 1967 and has been amended in 1989 and 2003. The Head of Government is the Premier. A cabinet is nominated by the Premier and appointed officially by the Governor. The legislative branch consists of a bicameral parliament. The Senate is the Upper House and consists of eleven members appointed by the Governor on the advice of the Premier and the Leader of the Opposition. The House of Assembly is the Lower House and the thirty-six members are elected democratically to serve a five-year term. The current Governor is Sir John Vereker, appointed on April 11, 2002. Following his victory over former Premier Alex Scot at the Progressive Labour Party delegates' conference in October 2006, the current Premier is Ewart Brown. The United Bermuda Party serves in opposition. The Progressive Labour Party leadership supports independence from the United Kingdom, although polls continue to indicate that this is not supported by the population. A referendum in 1995 on independence, held by the United Bermuda Party, was defeated. 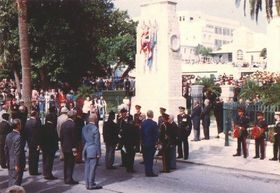 The defence of Bermuda remains the responsibility of the British Government. Until the American Revolutionary War, during which time Bermuda became the Royal Navy's Western Atlantic headquarters, the Bermudan Government had maintained militia for the defence of the colony. Once the Royal Navy established a base and dockyard defended by regular soldiers, however, these militias became superfluous and were disbanded following the War of 1812. At the end of the nineteenth century, the colony did raise volunteer units to form a reserve for the military garrison. Due to its near central location in the North Atlantic Ocean, Bermuda again became an important location during World War II. In 1940, the Destroyers for Bases Agreement allowed the US military a presence in Bermuda. The US built new bases there in 1941 under a 99-year lease, operating them until the end of the Cold War. The bases consisted of 5.8 km² (2.25 mi²) of land, largely reclaimed from the sea. For many years, the Americans used the airport as a forward point for aircraft looking for submarines, first German and later Soviet. Canada also established a radio-listening post on the northern tip of the islands during this time. In the 1950s, after the end of World War II, the Royal Naval dockyard and the military garrison were closed. A small supply base continued to operate within the dockyard area until it, too, was closed in 1995, along with the American and Canadian bases. The US bases closed on 1 September, but unresolved issues concerning the withdrawal of the American forces (primarily related to environmental factors) delayed the formal return of the bases' land to the Bermudan Government until 2002. Today, the only military unit remaining in Bermuda is the Bermuda Regiment, an amalgam of the voluntary units originally formed toward the end of the nineteenth century. Bermuda is located in the North Atlantic Ocean, roughly 580 nautical miles (1074 kilometers) east-southeast of Cape Hatteras on the Outer Banks of North Carolina and roughly 590 nautical miles (1093 kilometers) southeast of Martha's Vineyard (see map). 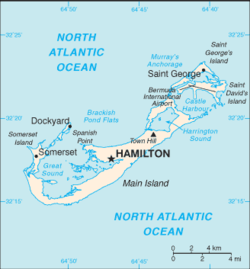 There are two incorporated municipalities in Bermuda: the City of Hamilton and the Town of St. George. There are also a number of localities which are sometimes called "villages", among them Flatts Village, Tucker's Town and Somerset Village. Contrary to common misconception, Bermuda is not located within the tropics. The subtropical climate is strongly influenced by the Gulf Stream which flows nearby. Bermuda has a very humid climate and, as a result, the summer-time heat index can be very high, even when the actual temperature seems moderate. Winters are mild with average daytime temperatures in January and February around 20 °C (68 °F). The powerful winds and heavy rain mean that the felt temperature can fall below freezing, even though the actual temperature may rarely drop much below 10 °C (50 °F). The only source of fresh water in Bermuda is rainfall, which is collected on roofs and catchments (or drawn from underground lenses) and stored in tanks. Each dwelling usually has at least one of these tanks forming part of its foundation. As the offshore domicile of many foreign companies, Bermuda has a highly-developed international business economy; it is a financial exporter in insurance and other financial services. Tourism forms the other major part of Bermuda's income. Bermuda's per-capita income is approximately 50% higher than that of the United States; CIA data shows a GDP of $4.5 billion in 2004, implying a per-capita amount of $69,900. Based on 2004 data, this gives Bermuda the highest GDP per capita in the world. Bermuda is regarded as a premier offshore business jurisdiction, with no direct taxes on personal or corporate income. The local tax system is based upon import duties, payroll taxes and consumption taxes. Such are the numbers of leading international insurance companies based in Bermuda that the territory is considered the world's reinsurance centre. Those internationally owned and operated businesses that are physically based in Bermuda – of which there are around four hundred – are represented by the Association of Bermuda International Companies (ABIC). In total, over 1,500 exempted or international companies are currently registered in Bermuda. Tourism is the second largest industry, with the island attracting most of its visitors from the United States, Canada and the United Kingdom. Much of this traffic arrives at Bermuda International Airport, the territory's air link to the outside world. The currency is the Bermuda dollar, which is pegged to the US dollar. US notes and coins are used interchangeably with Bermudian notes and coins within the islands. Bermudian notes carry the image of HM Queen Elizabeth II. 54.8% of the population is listed as black, 34.1% as white and 6.4% as multiracial. The island has a growing Asian community. A significant segment of the population is also of Portuguese heritage, the result of immigration from Portuguese-held islands (especially the Azores) during the past century. Its beginnings may be traced to several Madeiran families in the 1840s. During the last census, racial identification became a point of controversy; the demographic descriptions used in the previous paragraph, for example, may be considered misleading. A small minority of the island's black population has a diverse ancestry, including significant European and Native American bloodlines. Portuguese Bermudans are often thought of as constituting a separate racial group, in similar fashion to Hispanics in the USA. Immigrants from Portuguese islands included blacks from the Cape Verde Islands, and many Portuguese intermarried with "black" and "white" Bermudans. Consequently, there are many islanders with Portuguese ancestry, heritage, and names who are not considered among the ten or so percent of the population typically listed as "Portuguese". Resurgent interest in the island's Native American past, especially in St. David's, is leading many to identify themselves with the various Algonquian peoples sold into slavery on the island during its first century of settlement. In addition to large-scale Portuguese immigration, there has been sustained immigration from the West Indies during the past century. 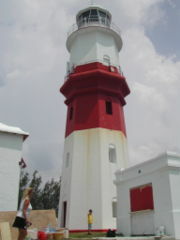 St. David's Lighthouse, one of Bermuda's visitor attractions. * Last Thursday in July if 31 July, otherwise first Thursday in August. Bermuda's culture is strongly influenced by the British colonists who came to the island, establishing most of its traditions and customs; but also by its closest geographical neighbour, the United States. A large proportion of Bermuda's population is descended from African-American slaves. Dance and music are two important elements in Bermuda's culture. Many dances were influenced by imported Native American and African slaves. Caribbean influences dominate the musical scene on the island. Clyde Best, a pioneering English footballer of the late 1960s and 1970s. Donald Henry "Bob" Burns, holder of the Guinness World Record for the loudest human voice. G. K. Butterfield, US Congressman (D-NC), former Superior Court judge and state Supreme Court justice. Diana Dill, actress and mother of Michael and Joel Douglas. Major-General Glyn Charles Anglim Gilbert, highest-ranking Bermudan soldier. Shaun Goater, former Manchester City F.C. striker. Edward Harris, archaeologist and creator of the Harris matrix method of archaeological stratigraphy. Clarence Hill, Olympic boxing bronze-medal winner. Mary Prince, slave whose narrative History of Mary Prince helped to end slavery in the British Empire. Arthur Rankin, Jr., film producer, director and co-founder of the Rankin/Bass production company. Clarence "Nicky" Saunders, Commonwealth high jump gold-medal winner. Gina Swainson, former Miss World 1979-1980. Edward "Teddy" Tucker, diver and treasure hunter.